We all have things in life that mess us up. Some result in really bad stuff happening. Others are less severe. I like to think my problem with birds lies in the latter category. But I guess that’s actually relative. Nevertheless, I regretfully and proudly would like to make the formal announcement of my (with any luck) terminal alectorisosis. This is a bad disease. Dis-ease. It sounds so benign, yet it’s poetically perfect in its efficient description of negating ease. 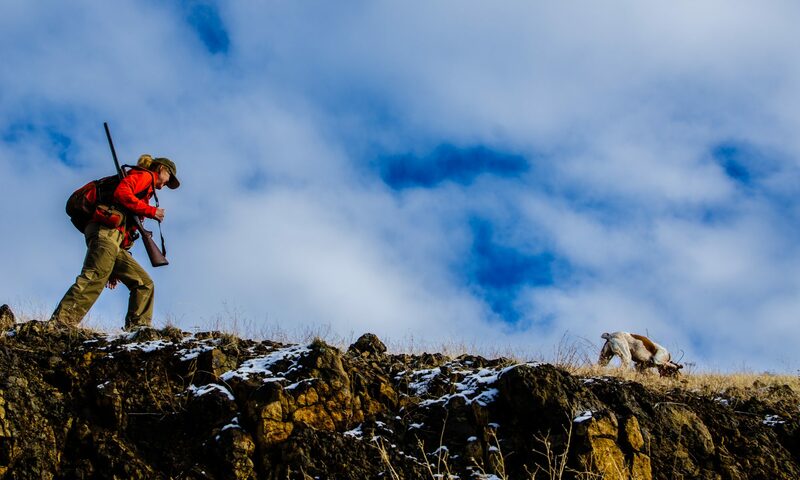 There’s nothing easy about hunting chukar. Hunting chukar comprehensively disses ease: there’s no easy route, no easy approach, no easy way to locate the bastards, no easy terrain to gain footholds on, no easy stance when your dog is locked on point but still not exactly sure where the bastards are laughing at you non-avian life-forms from, no easy way to predict their launch (their flight schedules are far less reliable than any of the major airlines’, regardless of their putative on-time departure records), no easy shots, and – mos’ def’ – no easy retrieve if you’re lucky enough to hit one. Worse, there’s no easy explanation for why this pursuit is so addictive. And all-encompassing. I’d be much better at what I “do” if I didn’t suffer the heartbreak of alectorisosis. I wouldn’t fabricate an excuse to spend all day with 500+ 16-year-olds just to ride on the Chukar Bus instead of teaching my classes (while wishing I were actually looking for chukar). I wouldn’t find it so supremely funny and oh-so-ironic to see well-intentioned mascot-derived signs and – far worse – take pictures of them with my stupid phone and post them on facebook. I wouldn’t consider breaking the glass on the chukar diorama which explains in true death just what in the hell the mascot of this community college is (although most attendees aren’t sure how to pronounce the word, not to mention from whence their mascot originates; I can imagine the horrified facial expressions were they to learn that Al Qaeda and chukar aren’t super strange bedfellows). But I hope there’s no cure. I hope there’s no hope for me. The dearth of real chukar, for me so far this season, threatens an unwanted remission of terminal alectorisosis. Friends keep telling me not to lose faith, that the disease will re-intensify, or at least its symptoms will. I want to believe them. I want to believe. I want to keep this disease alive. Bob, you are spot on. There is no cure. I have even gone to the extent of replacing body parts but the disease remains. Nothing like getting down with the sickness. You have a the best terminal illness known to man. Relish it.